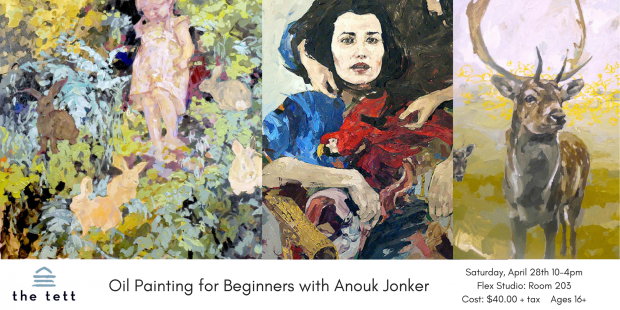 Join TETT resident artist Anouk Jonker for a hands-on, guided introduction oil painting. The class is designed to help beginners learn the basics, including choosing painting tools, mixing colours, and building up paint layers. Students will first carry out painting exercises to familiarize themselves with the medium and then complete a landscape painting. Ultimately, participants will gain the skills to use oil paints at home! All levels welcome, perfect for total beginners. Spots are limited to encourage a small intimate atmosphere. Anouk was born in 1989 in Uithoorn, the Netherlands. She received her BFA in 2011 from California College of the Arts in San Francisco, and has since continued to develop her studio practice. She is currently a member of the TETT Centre for Creativity and Learning in Kingston, Ontario. She is also an MA student at Queen’s University in Technical Art History. Although she continues her work as a portrait artist, her recent paintings reference issues in Western Art History, including early controversial methods of art conservation. She works primarily with oils on canvas with an impasto technique, but also likes to sketch, dab, drizzle, and erase. The paintings offer ambiguous narratives by piecing together various historical references such as Dutch still-lifes and early 19th century photographs. Anouk’s paintings have been exhibited internationally in countries such as Ireland, France, the Netherlands, and the United States. She has tried to combine her passions for art and travel, participating in several artist residencies. See below for photos!